Nowadays, we hear a lot of breakthroughs about DNA. However, despite the countless studies that had been published and medical advances that emerged, many people are not familiar with the concept. What is DNA exactly? How is it related to RNA? What are their differences? The code of DNA is similar in all living organisms, it has a universal language. All human DNA is 99.9% identical and the remaining 0.1% is unique to every individual. These are identifiers found in the body and serves as a genetic blueprint that would determine biological characteristics. Normally, a DNA molecule consists of approximately 3 billion base pairs, which are known as the building blocks of DNA. DNA is designed to serve its function. One important function of DNA is Replication – the double helix structure of DNA molecule allows separation of the strands to be able to bind with newly developing DNA molecule. 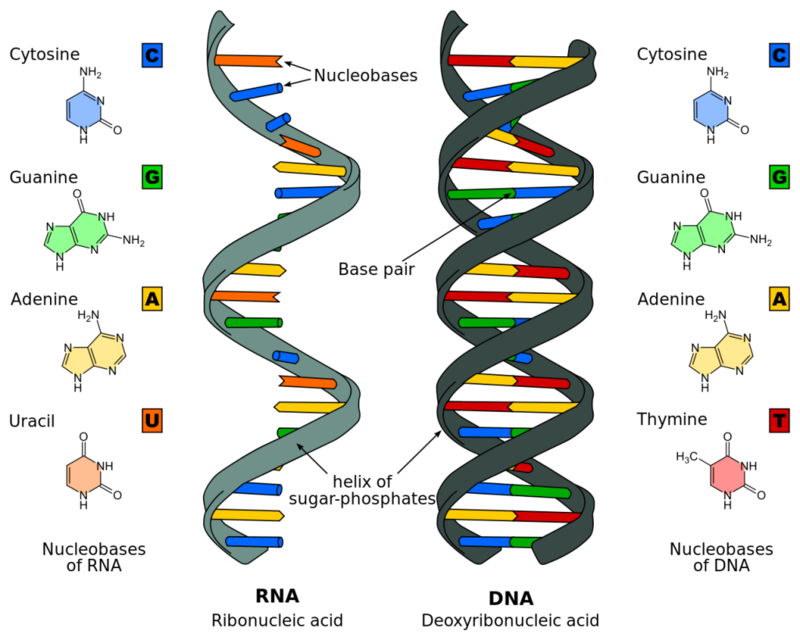 The double helix can give birth to an indefinite number of DNA molecules as long as the replication process goes on. The DNA molecule is made up of subunits that contain sugar and phosphate group. In addition to this, there are four nitrogenous bases that allow for the molecule to be arranged in a manner by which a code is formed. DNA is found in nearly every cell in the body. Nuclear DNA – resides in the nucleus of the cells. Mitochondrial DNA – found on the smaller organelles known as the mitochondria. RNA is a nucleic acid consisting long chain of nucleotide units. Like the DNA molecule, every nucleotide consists of a nitrogenous base, sugar and phosphates. DNA “unzips” as the bonds break. The free nucleotides lead to the RNA pair up with the complementary bases. The spirals take shape from the sugar and phosphates and become the backbone. The task of mRNA is to carry genetic messages regarding protein sequence from the DNA genome to the ribosomes within the cell. Ribosome is an organelle found floating in the cytoplasm or in the endoplasmic reticulum, this is where protein is synthesized. These are transfer RNA molecules that bind to amino acids in a definite sequence on the MRNA. Appearance DNA appears as a Double Helix. It appears like a twisted ladder. Within the structures are rungs represented by Four-letter DNA alphabet. The spiral is also made up of sugar and phosphate. RNA looks like a spiraling thread with bases sticking out towards the center. It also consists of sugar, phosphates and nitrogenous bases. The discoveries of DNA and RNA have been a significant milestone in human history, but there are a lot more to learn about them because they are highly technical in nature. All we know right now is that DNA and RNA make up every living organism similar, but at the same time, they also make us unique from each other. Jade Sison. "Difference Between DNA and RNA." DifferenceBetween.net. September 28, 2017 < http://www.differencebetween.net/science/difference-between-dna-and-rna/ >. consists of nucleotide not proteins. To be honest I’m mean all the time but you look like a baked potatoe that came straight out of the oven boi with pepperoni all over your face and your forehead look like the Hoover damn and yo teeth look like two chainsaw that chop wood for Home Depot. I have woach it full parts and Iam sucssesfull with it.